Age & science: do scientists make their best discoveries during their 30s? Although Einstein himself did his most seminal work prior to his 30th birthday, this is not the case for all scientists. Alexander Fleming was 47 when he discovered penicillin, Andrew Wiles was 42 when he proved Fermat’s theorem and Luc Montagnier was 51 when he discovered HIV with his colleagues. We have put together an infographic on this page showing 80 famous scientists and the age at which they did their most notable work. This is only a small sample of scientists and is clearly not a comprehensive or scientifically rigorous study, but it is interesting to see nevertheless. 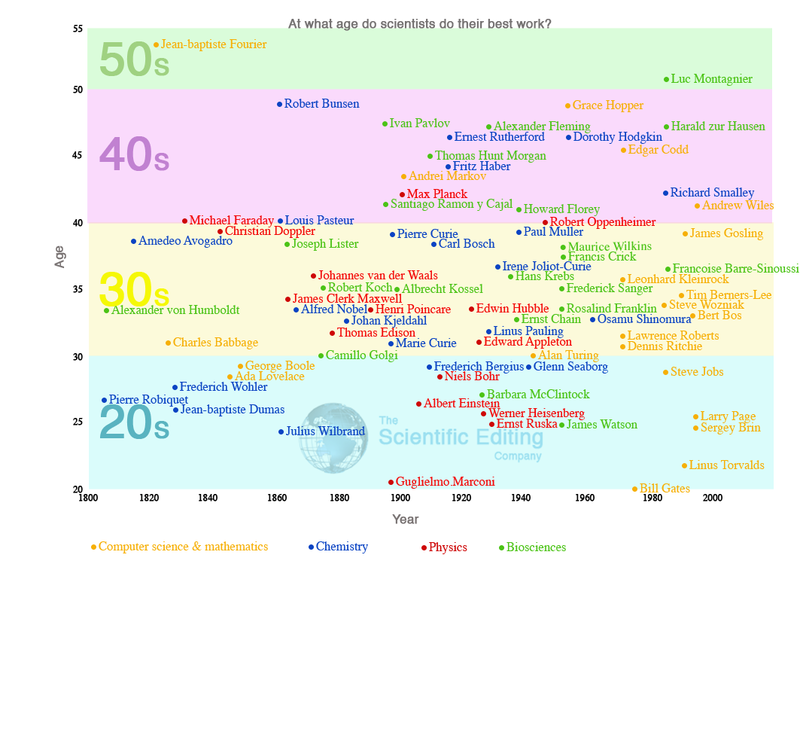 We made a list of famous scientists and discoveries from the 19th and 20th centuries then looked up the age at which they did their most notable work. We placed them into four categories: computer science & mathematics, chemistry, physics and biology. The decade that stands out as the most productive for the scientists in the infographic appears to be their thirties. So is there any correlation between age and pioneering discoveries? A quick dive into Google scholar revealed a number of research papers on the subject. A study in 2002 examined 50 Nobel prize winners from each of the three prizes for physics, chemistry and medicine. This study recorded the age of the scientists when they had done the work that was rewarded with the prize and found that the centre points for age were: physics, 34; chemistry, 37; medicine, 40 (Marchetti C, 2002.) A study published in 1993 investigated a similar data set and concluded that scientists tend to be the most productive in their mid-thirties (Stephan & Levan, 1993.) Finally, a 2008 study of 300 randomly selected bioscientists revealed that the most productive age was 36-40 (Falagas et al., 2008) based on the number of citations from their publications. These studies all indicate that a scientist’s greatest potential for discovery is during their thirties, so perhaps Einstein was mistaken. Today, a large number of young PhD graduates and postdocs leave science due to uncertain career structures, low salaries and recurring short-term contracts with no prospect of a permanent position. Could we be losing talented scientists before they reach their potential? Scientific success can be attributed to several different factors including education, motivation, economics, academic culture, creativity, experience, mentoring, funding trends and a reasonable dose of luck. Any correlation between age and success should be considered with these factors in mind before reaching a conclusion. However I can’t help thinking that we are losing many highly trained, talented scientists and therefore stagnating our potential for innovation. If scientists are more innovative in their thirties as the aforementioned studies conclude, then we must ensure that our current academic system supports young scientists aiming to reach this stage. Those postdocs that stay in science continue to do full-time research well into their thirties, a time that is largely free from grant writing, administration and teaching. They will have accumulated years of valuable experience during their PhD and research posts, putting them in the optimal position for scientific discovery. However, most postdoctoral posts only last for two or three years, making it difficult to follow up on important results and often resulting in unfinished work. Additionally, several postdocs will leave in favour of more secure positions for economic and family reasons. Younger scientists see the instability of a scientific career and may choose not to go in that direction. Issues such as these have been explored by scientists such as Jennifer Rohn who suggests alternatives to the current system, and the organisation Science is Vital. Hopefully more can be done to retain our scientific talent and to prevent the stagnation of discovery. Falagas ME, Ierodiakonou V, Alexiou VG (2008) At what age do biomedical scientists do their best work? The FASEB journal, doi: 10.1096/fj.08-117606. Marchetti, C. (2002) Productivity versus Age. IIASA Contract No. 00-155, International Institute for Applied Systems Analysis, Laxenburg, Austria. Stephan & Levan (1993) Age and the Nobel prize revisited. Scientometrics, Volume 81 (2) 549-565. doi: 10.1007/s11192-008-2141-5.